I believe Steadfast by Jack Campbell marks the first time that I have read ten books in a series with one continuous plot line. Generally, I shy away from long series, but there is something about The Lost Fleet that just really works for me. Having chomped through the book in three days, I am happy to report that the series is still going strong! I was a bit worried, as I thought number 9 was starting to wander off course. It takes a bit of time for Steadfast to bring it back, but it’s an enjoyable enough ride, and by the end, the series is back to full strength, returning to the central plot line, and giving us plenty of space battles. A terrific way to pass a few, slow, rainy days in Oxford. 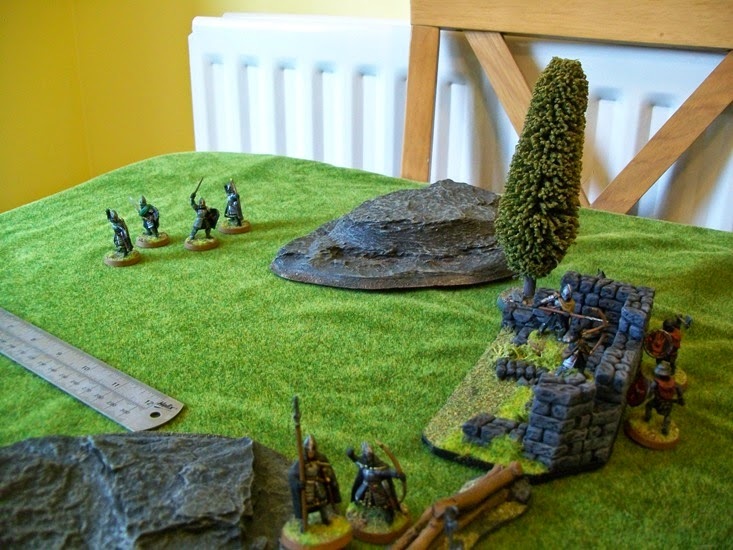 As the Orcs came pouring over the Rammas Echor, their captain had ordered them to fall back to the ruined redoubt that stood a mile or so behind the lines. When dawn came, only four men had made it to the redoubt. Tired, afraid, they decided they would hold their position, come what may. A few hours later, a small Orc scouting party, appeared before them. I set up this skirmish because I had just made a new little set of ruins out of some left over Hirst Art blocks, and I wanted to test it out in battle conditions. It was a very simple set up. 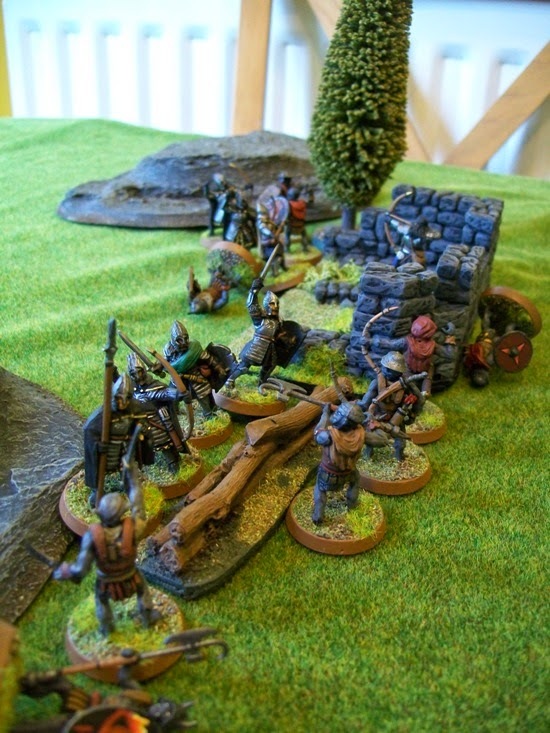 Four Gondorians held the redoubt, attacked by six orcs. Both sides had four additional troopers who would come in at a random point in the game. I'm using Wargames Factory Orcs for the forces of Mordor these days. They aren't the highest quality pieces, but I love the look, and the box set allows for huge variety of posses and weapons. I do cut the feet off their integral plastic bases before gluing them to GW bases in order to keep their height down to right about man-sized. 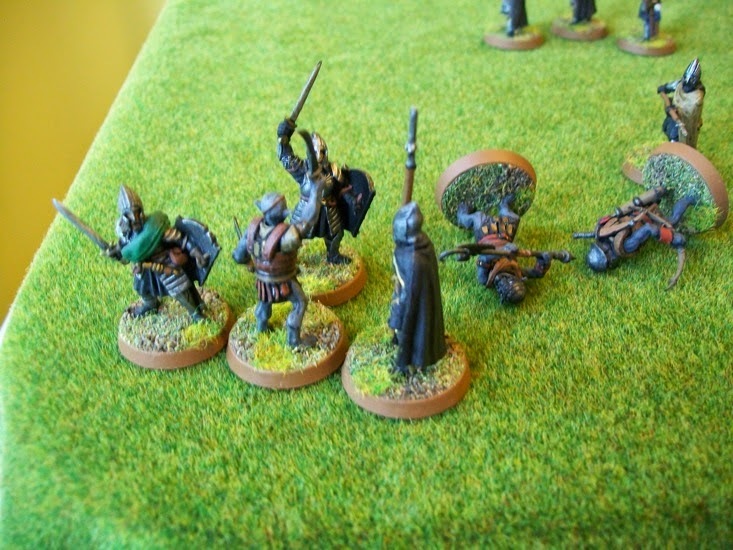 The Gondorians drew first blood, shooting down an Orc as he charged over a low rise. 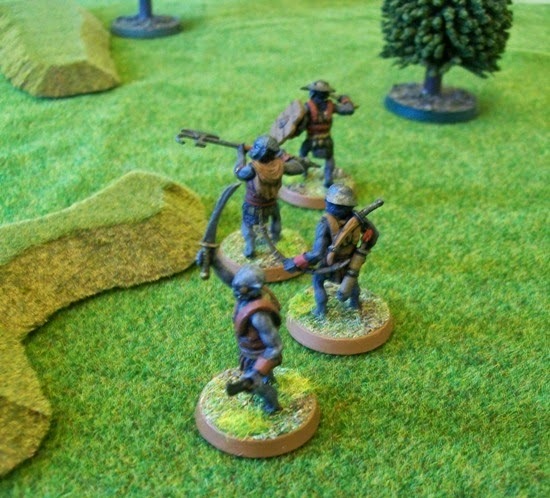 Just as the first Orcs rushed headlong at the old redoubt, four more Gondorians come running to the fight! 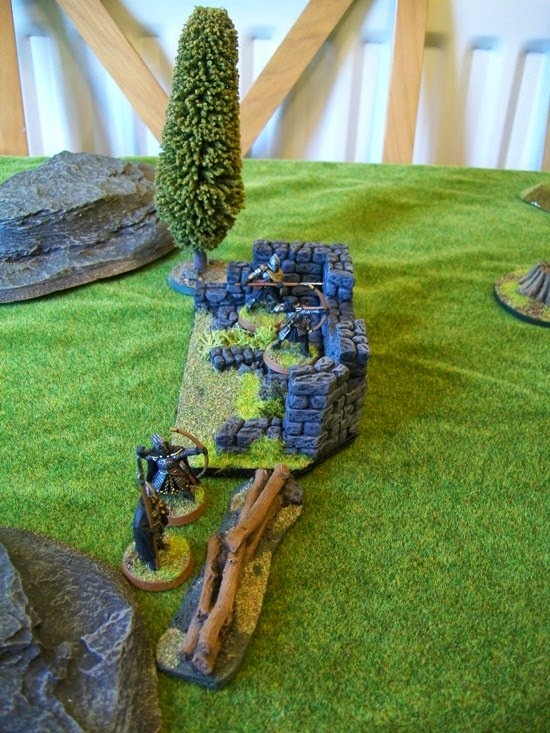 (note the little horns of the Orc sneaking around the top of the redoubt). For a moment it looked pretty grim for the brave defenders. 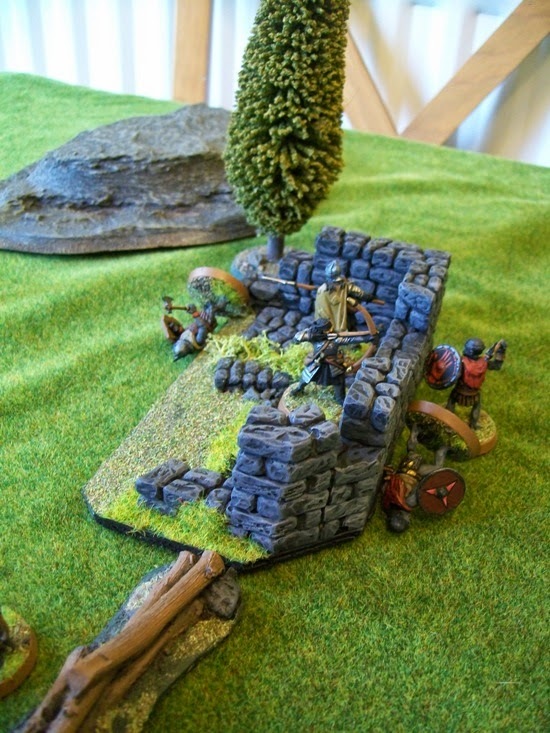 One Orc had managed to slip around the walls and attack from behind as the others tried to climb over the walls. 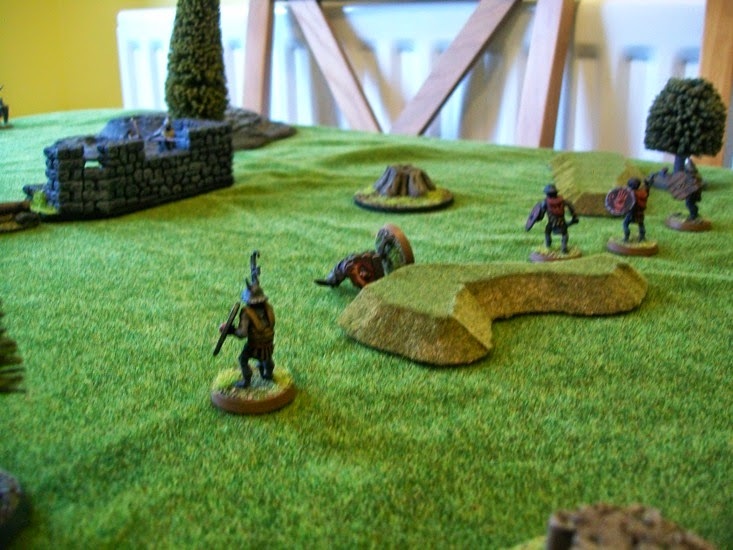 At that moment, another cry rang out over the field, and another small groups of Orcs joined the fray. 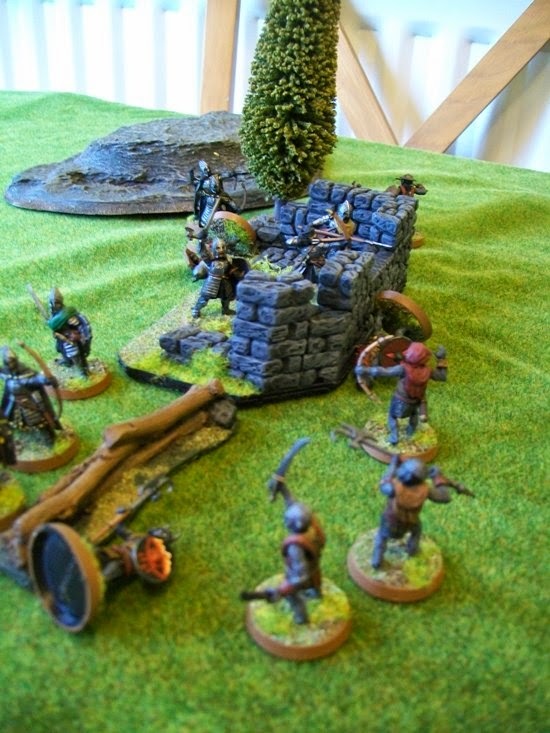 In a great display of martial prowess, the two soldiers holding the redoubt killed a pair of Orcs, including the one that had come from behind. Another fell off-screen. Both sets of reinforcements reached the redoubt at about the same moment. 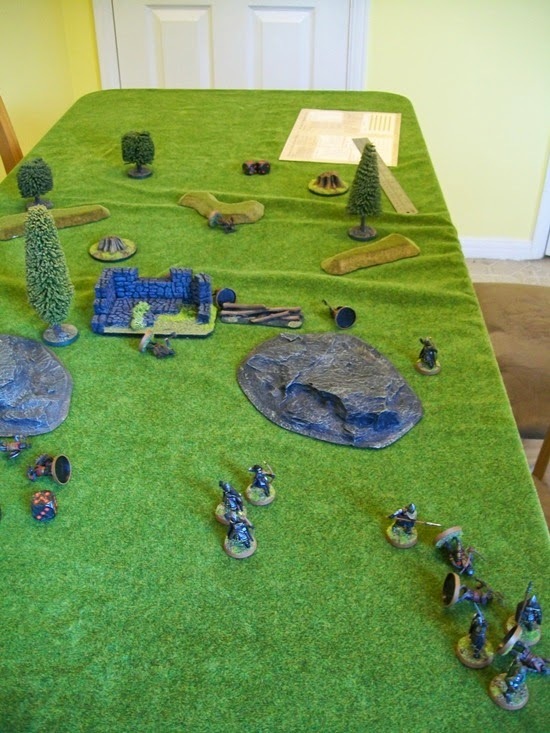 Four Orcs charges to the left, while two more attempt to fight their way around the right. After the Gondorians hacked down another Orc, the Uruks lost their nerve and decided to try and run past the defenders instead of fighting them. Every Orc for himself! The two Orcs at the top of the screen were both shot down, seconds after this photo was taken! The last three Orcs nearly made it off the board before being run down. Amazingly, the Gondorians managed to exterminate the Orc force, while suffering no casualties. The old redoubt, long abandoned, had served well this day. This morning I cycled into town with the specific goal of buying a copy of the new Tolkien translation of Beowulf, but the entire city of Oxford is sold out. Now admittedly, if there is one city in the world where this book was going to be really popular, it would be Oxford, but, by the same logic, you would think the bookstores would be ready for the rush. They weren’t. Both of the big book stores told me that they expected more stock in tomorrow. Thankfully, the trip did not prove to be wasted. 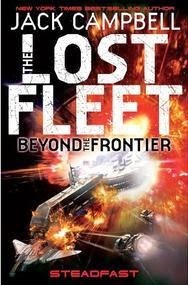 By a stroke of luck, this week also saw the release of the latest Jack Campbell Lost Fleet novel – Beyond the Frontier: Steadfast, and I got the bookstore’s only copy. So, I’ll call the trip a win. 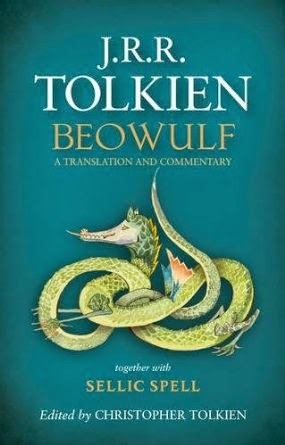 I suppose the only real surprise is that I didn’t pre-order Tolkien’s translation of Beowulf, which is released in the UK today. There are two reasons for this. I almost never pre-order anything and only do so if I think there is going to be a limited supply. There is no danger of that in this case. More importantly, I would rather support my local bookseller. Thankfully, Oxford has several good bookshops, and I would like to help ensure that they remain. Plus, buying Tolkien’s Beowulf in a Oxford bookstore just seems right doesn’t it? I’m not exactly sure when I’ll be able to make it into town to pick up a copy, but I suspect it won’t be long. Mostly the line struck me because of its inherent poetry. I don’t really know anything about Icelandic poetry, though I have studied a bit about Anglo-Saxon verse, and I wouldn’t be surprised if the two shared a lot of similarities. Most lines of Anglo-Saxon verses are divided in half, with each half containing some form of alliteration. Such an arrangement can be seen in this line. In the first half of the line, both words end in ‘rd’ (poetic alliteration doesn’t demand that the consonantal repetition be in the first letter). The second half, of course, contains the double ‘b’ as well as picking up some nice assonance with the repeated long ‘o’ sound from ‘no’ and ‘bones’. These elements caused this little five word phrase to bounce around in my head for days after reading it. The other notable thing about the line, and perhaps the more immediately obvious to most people, is that it is a much more compact form of the children’s taunt ‘Sticks and stones may break my bones but words will never hurt me’. This little taunt also features a lot of alliteration, although its meter is probably a bit more modern. 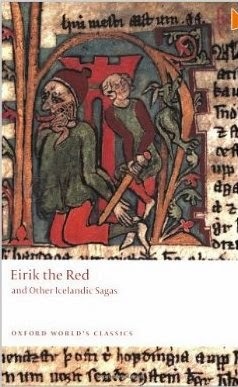 I don’t know how much of the line is the responsibility of the translator and how much came from the original writer, but either way, it’s a fantastic bit of phrasing, that just seems perfect for harsh and often cruel world of the Icelandic sagas. To be a modern Renaissance Troll, it is important to mix physical accomplishments with the mental and artistic ones. I must admit, over the years, this has not been my strong point. Since it looks unlikely that I will play softball this year due to time commitments, this puts a lot of pressure on my one other athletic pursuit of cycling. This time last year, I was tallying up over fifty miles as week on my commute to and from work. However, a bad winter, a broken wrist, and an office move a mile farther away at the top of an agonisingly steep hill has dropped that average considerably. 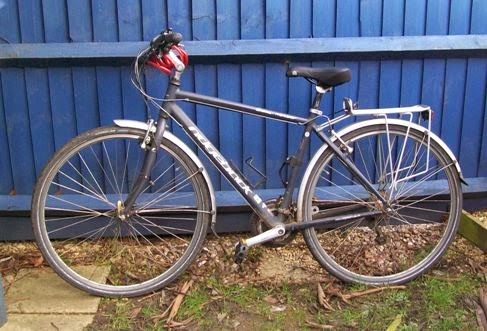 At present, I’m averaging two days of cycling to work a week (which is 30 miles), but even that has proved tough on my psyche. That last mile of climb up to my office is so dang hard, it really takes a lot of the fun out of it. Still, with spring truly descended upon England, I am feeling the itch to get up on my bike more often. I am still hopeful to hit my long-term goal of 10,000 miles by the end of the year. One of the challenges of collecting Games Workshop, Lord of the Rings figures is the size inconsistency within the range. This is especially noticeable between the older miniatures (especially the plastics) and the newer figures. 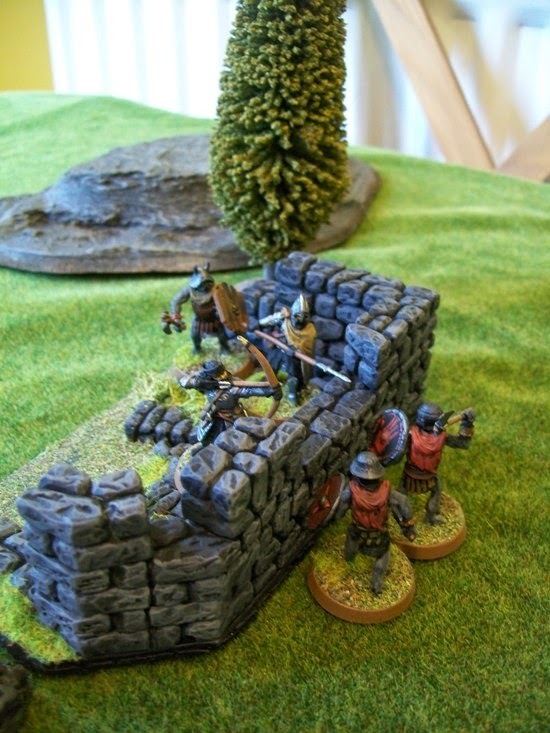 It is a shocking example of the miniature hobby concept of ‘scale creep’. Some people aren’t bothered by such issues and happily play with figures of wildly different sizes. Apparently, I am not one of these. I threw out all of my plastic warriors of Gondor because they were so small, though happily, in that case, there are enough metals available to collect those instead. 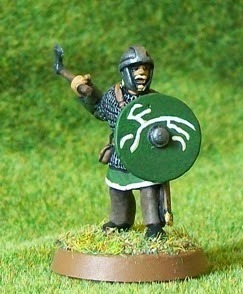 However, when it came to Rohan, most of the basic troopers, both mounted and on foot, are small plastics. I tried, but I just couldn’t deal with it. So, I started looking for substitutes. After a few weeks of searching and acquiring samples, I think I have found my warriors of Rohan with Musketeer Miniatures. I painted up my first one a couple of days ago, and I’ve got to say, I’m thrilled by these figures. This figure is actually a ‘Romano-British’ infantryman, but most of the figures I eventually use will probably come from the Goth range. Between all of Musketeers dark age ranges, there are lots of suitable figures both mounted and on foot. I am not completely happy with the shield. It was an attempt to paint the Uffington White Horse, which my wife and I cycled to from Oxford last year. I messed up the head a bit, but otherwise it is not a terrible rendering. It just seems to leave the shield a little open and plain. Partly this is because the boss forced the painting to go over the top, leaving the bottom open. If I were to do it again, I think I would, perhaps, paint a border first. Anyway, I don’t dislike it enough to change it. 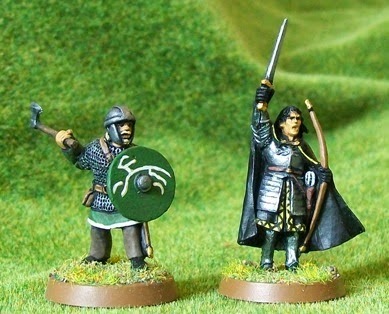 Size wise, I have included a comparison shot between the warrior and Beregond, a metal miniature from the GW LOTR line. As you can see, the sizes are pretty close. Height is near spot on. 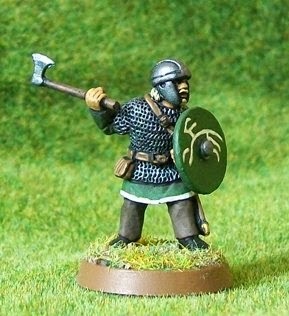 The warrior of Rohan is slightly broader (which is probably correct anyway) and has slightly more exaggerated hands and head, but neither are noticeable enough to bother me. 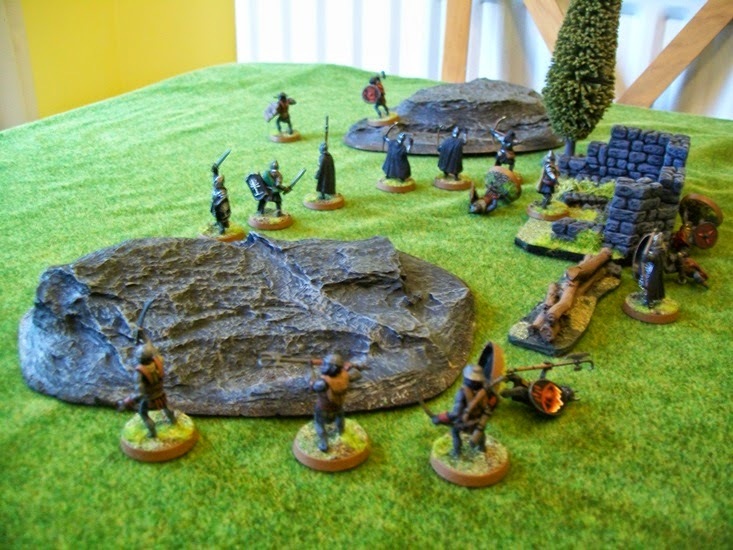 Although Rohan is not the next thing up on my painting table, I am already looking forward to getting some more Musketeer minis to create my Rohirrim. There is only one thing I didn’t like about Peter Jackson’s interpretation of the Witch King in his films, and that was the massively over-sized flail he wielded in his fight against Éowyn. The book says he used a ‘mace’. While the term mace is occasionally used to describe a one-handed flail, it more often refers to a metal club with some kind of spiked ball on the end. That is the kind of weapon that the Witch King used in my imagination, and that’s the weapon I wanted him carrying on my figure. 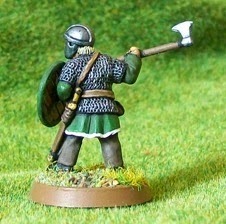 So, calling on the generosity of a fellow hobbyist, I acquired a plastic mace from a Fireforge plastic kit. It came attached to the arm, but that was no biggie. After cutting off the Witch King’s hand, I replaced it with the hand holding the mace. Just a quick pin and glue job. It’s a simple conversion, but I think it makes for a much improved figure. I think he is actually more menacing wielding this more believable mace than the over-sized flail. Nazgul aren’t really much fun to paint. 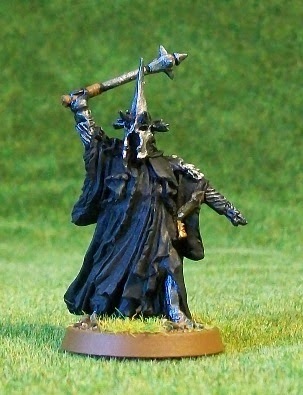 Even with a bit of extra silver on the Witch King, he is still basically a bunch of black robes. Still, a figure I’m glad to add to my collection.